Roman ruins. Byzantine villages. Umayyad architecture. The relics of the Hittites, Assyrians, Arabs, Mongols, Mamelukes, and Ottomans. Syria has some of the most remarkable cultural history in the world—and now, National Geographic reports that Syrians are using archaeological first aid to save it. At a recent workshop held in Turkey, near the Syrian border, curators and restoration experts taught Syrians emergency conservation techniques, such as wrapping mosaics and ceramics in Tyvek, a tough, lightweight plastic used in construction, before burying or sandbagging them. The workshop participants left Turkey with supplies of Tyvek and other hard-to-come-by items, like museum-grade glue. Top image: Syeefa Jay. AP Photo/Aleppo Media Center, AMC. 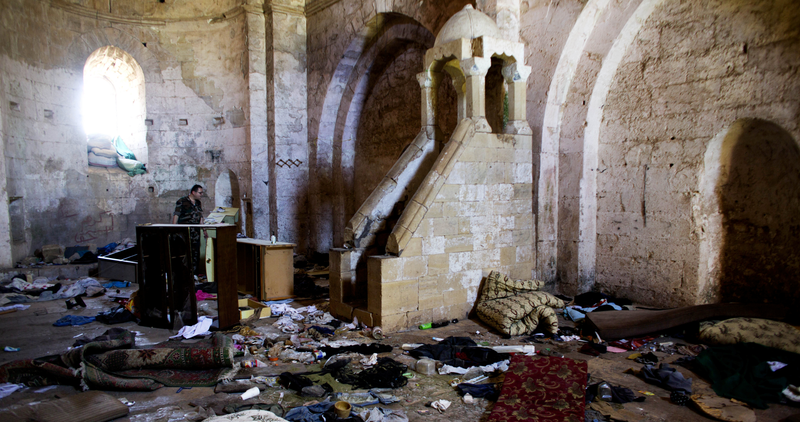 Lead image: The belongings of Syrian rebels inside a chapel at Crac des Chevaliers, the world's best preserved medieval Crusader castle. AP Photo/Dusan Vranic.